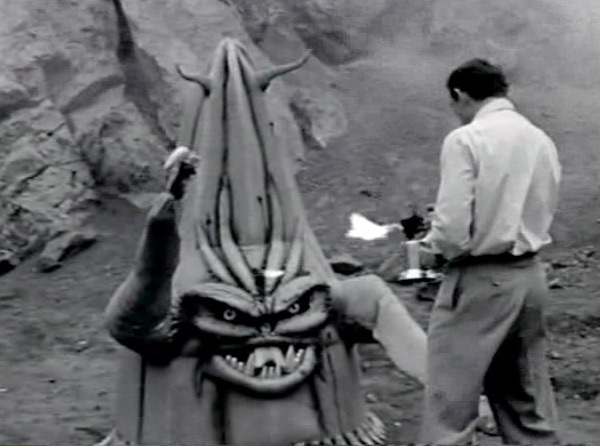 Last post I celebrated several of the more effective/imaginative creature effects done for low-budget sci-fi movies of the 1950s. In part 2 of How to Make a Monster, I thought I’d delve into some of my favorite stories of effects artists, crew members and even actors, who, when faced with adversity and little or no money to make things right, did everything they could to bring their monsters to life. The great filmmaker John Ford once said, “Most of the good things in pictures happen by accident.” If true, then the accident-prone pictures profiled here must be very good indeed. 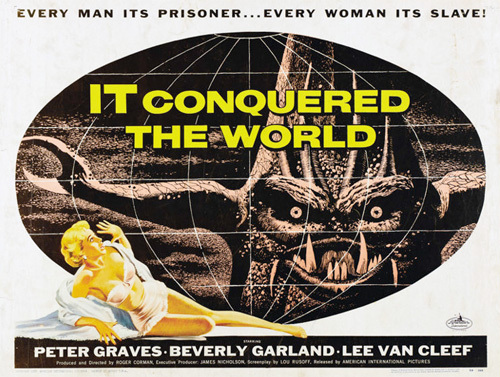 To recap from the last post, the extraordinarily creative B movie monster-maker Paul Blaisdell created a wild-looking creature for Roger Corman’s It Conquered the World (1956) that he affectionately dubbed Beulah (and that others at the time nicknamed the Space Cucumber). It was more of a mechanical contrivance than a suit, 6 feet tall and over 12 feet at the base, with moveable arms and crab-like pincers that could be manipulated with interior cables. From within the creature Blaisdell could also move the mouth via a wire. "A light? No thanks, I'm trying to quit smoking." "For the scene in which the monster is riddled with bullets, Beulah was outfitted with explosive squibs to simulate gunshots. For reasons of safety Blaisdell remained outside the costume, watching from the sidelines as the soldiers let loose with a barrage of rifle fire. On cue the squibbs detonated, leaving trails of smoke drifting in the air. When he thought he had enough footage, Corman yelled 'Cut!' He failed to notice that Beulah’s interior had become saturated with smoke, which started leaking out of every orifice on the creature’s conical body. 'I said cut!' Corman screamed. 'Keep filming!' Fingers were pointing at something behind Corman. Corman turned around and saw his movie monster smoking like a cherry bomb. He ran over the cameraman, Fred West. 'Did you get that?' Corman asked. 'No, you said to cut,' West replied. Another classic “It” that Paul Blaisdell designed and created from scratch was It! The Terror from Beyond Space (1958). More than 20 years before Alien, It! featured a terrifying humanoid-reptilian monster from Mars that stows away on a spaceship bound for earth and starts hunting the unsuspecting astronauts. "See if you can guess what this next shadow animal is!" 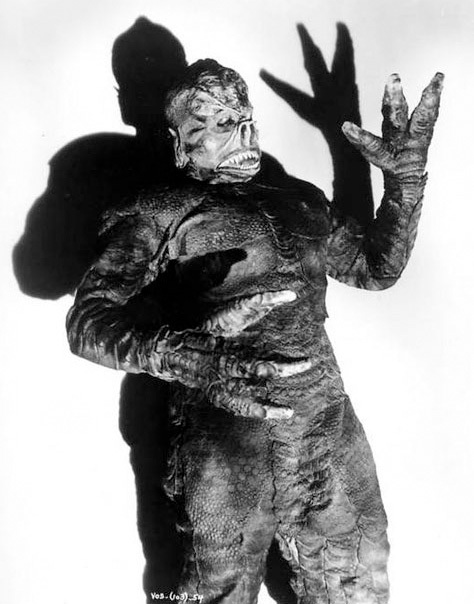 Inventive as always, Blaisdell built the suit up from a pair of long johns that the stunt man portraying the monster, Ray Corrigan, provided. He modeled lizard-like scales of different sizes in clay, then applied the finished latex ones in overlapping patterns to give the suit maximum flexibility. He fashioned the creature’s wicked-looking teeth and claws in soft wood. "Ray Corrigan was standing in the center of the room wearing the It costume, holding the headpiece under one arm while the film’s makeup artist, Lane 'Shotgun' Britton, dusted his eyes with a mixture of powder and greasepaint. 'What’s going on?' Paul asked. Blaisdell added a bottom row of teeth to further conceal the chin, and It! was ready to go menace some astronauts. 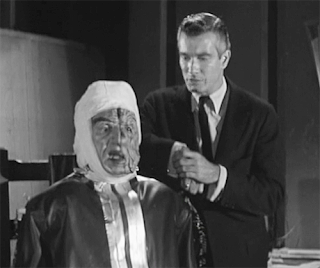 Frankenstein’s Daughter (1958), directed by B movie maestro Richard Cunha, updated the Frankenstein story to 1950s Los Angeles, and ambitiously featured two mad scientists and two (allegedly) female monsters. "The girl at the mall told me this lipstick was perfect for my skin tone." One of the scientists, Carter Morton (Felix Locher), decides to test his formula for ridding mankind of disease and old age on his niece Trudy (Sandra Knight). One of the regrettable side effects is a physical reversion to a bestial, cavewoman state. His partner, the truly mad Oliver Frank (Donald Murphy) is a chip off the old Frankenstein block -- he wants to sew the head of an innocent young girl onto a dead body and bring it back to life as… Frankenstein’s Daughter. All well and good, except no one told the make-up man who was to create the monster that it was supposed to be female. All he knew was that he was making up a very male actor, Harry Wilson, and he made the natural assumption that the monster was male as well. They carried on in the finest B movie tradition by having the makeup man slap lipstick on Wilson’s mug, creating a monster that only a Franken-mother could love.